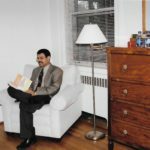 Krishna going through the book on the legacy of his father that he will present to Peter Goddard, Director of the Institute. 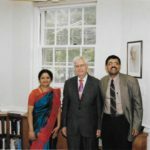 Krishna Alladi and Mathura with Prof. Peter Goddard, Director, Institute for Advanced Study, in his office. 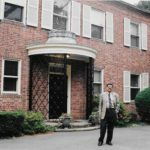 A portrait of the great physicist Dirac is on the wall behind. 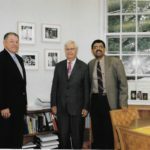 Krishna Alladi with Associate Director Michael Gehret (left), and Director Peter Goddard (center), in the Director’s Office of the Institute for Advanced Study, Princeton. 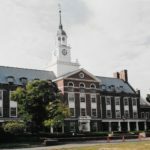 Fuld Hall, the imposing main building of the Institute for Advanced Study, Princeton. 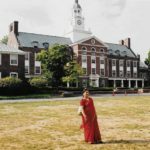 Mathura Alladi in front of Fuld Hall. 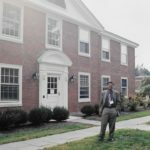 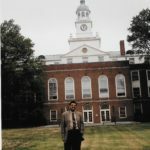 Krishna Alladi in front of Building B where he had his office in 1981-82 when he was a Visiting Member at the Institute for Advanced Study. 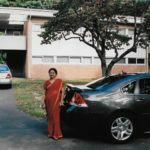 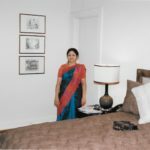 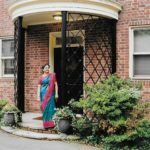 Mathura Alladi in front of 56 Einstein Drive, the apartment she and Krishna had in 1981-82 in Princeton. 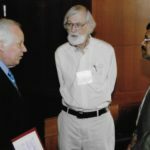 Krishna Alladi in discussion with 1974 Fields Medallist Enrico Bombieri (left) and 1962 Fields Medalist John Milnor (center) after Milnor’s lecture. 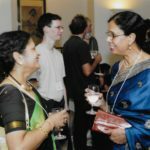 Mathura in conversation with the Librarian of the Institute for Advanced Study during the Conference Reception. 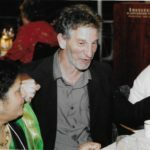 At the Conference Banquet, Mathura was seated next to Professor Peter Sarnak of Princeton University and the Institute for Advanced Study. 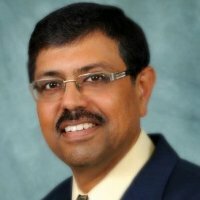 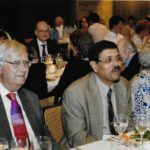 At the Conference Banquet, Krishna Alladi was seated next to Prof. Peter Goddard, Director of the Institute for Advanced Study. 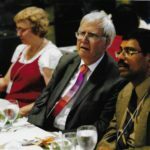 Seated right behind Director Peter Goddard and Krishna are Krishna’s colleague 1970 Fields Medallist and 2008 Abel Laureate John Thompson and his wife Diane Thompson.